Our Personal Training Studio and Melbourne Exercise Physiology Clinic is at 378 Mt Alexander Road and below is a quick guide on how to get to our studio. Whether you want to drive, use the tram, train or walk, Moonee Valley Health and Fitness is easy to get to, no matter where in Melbourne you are coming from. South Street, Ascot Vale: This street always has plenty of parking and is either 1 or 2 hour parking. 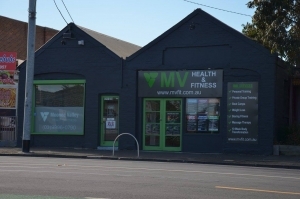 From South Street, the Moonee Valley Health and Fitness Studio is directly adjacent to it. Middle Street, Ascot Vale: The Laurel hotel is on the corner of Mt Alexander Road and Middle Street and is less than a 50 meter walk to our personal training studio and has 2 hour parking all along Middle Street if needed. Alternatively there is also the Dan Murphy’s car park that offers parking. Ayr Street, Ascot Vale: Ayr Street is a quite street that runs along the back of the Church of Scientology of Melbourne and has 2 hour parking along the whole street. Our studio is almost directly across the road from the Scientology building so our clients can also park out the front of their building. Baroda Street, Travancore: Baroda Street is a side street off Mt Alexander Road that has plenty of parking available. Access to the back entry of the Moonee Valley Health and Fitness studio is on Baroda Street, and we also do have some parking available in our off street car park (although spots are limited). As you can see, there is plenty of parking available, but being on a major road in Melbourne’s inner northern suburbs it can also get quite busy at times, so it’s always good to have plenty of parking options available. If you would like to catch the train to get to our personal training studio, the Ascot Vale Railway Station and the Newmarket Railway Station are on the Craigieburn Line and both are only a short walk to the studio. For those of you who would like to ride your bikes to training and get in a bit of extra exercise before your pt sessions there is a bike rack directly out the front of our building to lock up your bike.